One of the ways that companies gauge if a CRM solution like Salesforce is the right fit for their organization is to look at how other companies, ideally in their own industry, have succeeded with the tool. 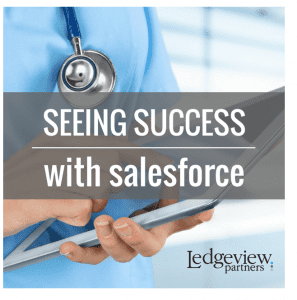 Keep in mind, there are LOTS of other factors that go into it (like finding an awesome partner like Ledgeview to work with) but we are here to shine a quick spotlight on VitalWare – a leading provider of cloud-based technologies for Healthcare Providers and the success they are experiencing with Salesforce. In 2015, VitalWare was ranked #123 in the Inc. 500 ranking of fastest-growing private companies in the United States, with their growth fueled by their ability to deliver best-in-class products and services that provide a powerful user experience. In other words, VitalWare identifies and simplifies the regulatory challenges facing their customers in the healthcare industry, which makes their lives easier. As a fast growing company, VitalWare needed to take a page out of its own playbook and select a CRM solution that made its life easier. And that’s just what they found in Salesforce. “Selecting Salesforce was based on the fact that it was a true platform, with a deep assortment of features and more support” stated Kyle Smeback, VitalWare’s Sales Operations Manager. VitalWare, as a SaaS (software as a service) company, understood the value that Salesforce could provide. But they needed someone to help them rapidly apply best practices and guide them through an aggressive migration timeline. Yep, you guessed it. Ledgeview Partners. The transition went, well let’s use Smeback’s words. He said, “It went flawlessly.” In fact, even with an aggressive timeline, Ledgeview Partners was able to guide VitalWare through installation and configuration faster than planned, completing the transition a month and a half ahead of schedule. VitalWare has been up and running on their new Salesforce CRM system since April of 2016. In the short time since going live, the company’s seen a night and day difference in terms of the activity they’re capturing in the system. First of all, the notably superior user experience Salesforce provides has driven high user adoption. More people are using the system than ever before to record more information than ever before. Second, when Ledgeview helped VitalWare reengineer their lead conversion process, they developed a series of automated triggers that prompt next steps in the process. This has helped boost activity around each lead, and brought a new level of consistency to how the company follows up. They’ve become much more efficient, and their consistency has made their pipeline much more accurate. And that activity is fueling all kinds of change within the company. With Salesforce, VitalWare finally has a CRM solution that gives them the functionality and the flexibility they need to continue to grow and make a positive impact on the healthcare industry. 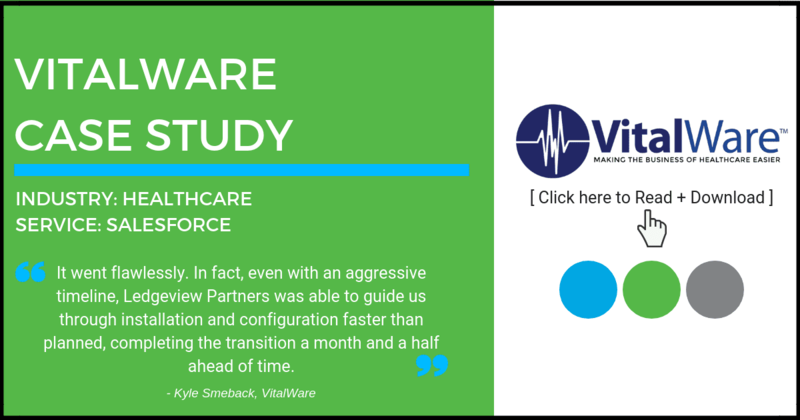 >>> Read more about the success VitalWare is achieving in the full case study.